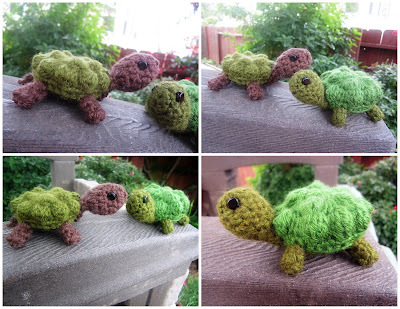 When Miss M said she wanted a little Amigurumi Turtle yesterday afternoon, it made me think.... WHERE did my yarn go??? It had been awhile since I crocheted anything (like, a whole week or so), and I could.not.remember where the yarn was. In the new storage ottoman. Out of sight, out of mind. Silly Mommy. Yarn problem sorted, I started making tiny little hexagons for his shell, but soon abandoned that idea and went with a simple, one-piece bobble construction. MUCH easier. You'll appreciate that as well. Trust me. Oh! If anyone tries this and has a pattern question or a comment or it just simply doesn't work the way it's supposed to, Please let me know. I'll make it right. Oh! OH! And furthermore... If you make one or two or 16.... I'd love to see pictures! Feel free to make and give. Not to sell, sugar. Thank you! -DC Bobble Stitch: *YO, insert hook in next stitch and pull up a loop. YO, pull through one loop (three loops left on hook). YO, pull through two loops (two loops left on hook). Leave loops on hook. Repeat * four more times, leaving the last loop of each stitch on the hook, until you have six loops left on the hook. YO once more, and pull through all loops. Bobble stitch completed. -HDC BLO Invisible Decrease: YO. Insert hook in BLO of next stitch. Do not YO. Do not complete the stitch. Insert hook into next stitch (again). Pull through two loops (both BLO stitches on the hook). YO, pull through all loops. Be careful here! When making a BLO Invisible Decrease, make sure you are inserting your hook into the NEXT stitch and not into one of the two you've already decreased. When completed, the Invisible Decrease looks like it was done in the first stitch/loop that you pulled through at the beginning of the stitch, and it's easy to think that the second of the pulled through stitches in your last decrease is the starting point for your next decrease. It's not. In my head, I always say "skip". 'Cause it LOOKS like that. -SC BLO Invisible Decrease: Insert hook in BLO of next stitch. Do Not YO. Do not complete the stitch. Insert hook in the next stitch (again). Pull through two loops (both BLO stitches on the hook). YO, pull through all loops. You may note the crazy similarity to the HDC BLO Invisible Decrease. You are so very clever. ROUND 3: Ch 2 (counts as first Sc). SC BLO Invisible Decrease around. Join to top of first Sc. (4 stitches). Tie off. Weave in ends. NOTE... If you aren't quite closed enough at this point, you can just close the hole a little further with your needle as you weave in the end. ROUND 1: Make a Magic ring with 6 HDCs. ROUND 2: Ch 2, HDC around. ROUND 3: Ch 2, HDC around. Sew leg to body. Repeat for three more legs. ROUND 2: Ch 2 (counts as first HDC). HDC around. Join to top of first HDC. Slip Stitch into the HCD directly opposite of your hook to close the leg. Should be the second or third HDC from round 2. It's not a precise thing. No worries. Tie off and weave in ends. Repeat for three more legs. ROUND 1: Make a magic ring with only three Chains. Ch 2 (counts as first HDC). HDC 5 times into the ring. Join to top loop of first HDC. ROUNDS 3&4: Ch 2 (counts as first HDC). HDC around. (12 stitches). STUFF Head at this point. Tie off, leaving a long tail. Sew neck to body with the yarn tail: Flatten and place the base of the neck along the line where the shell meets the belly. Sew neck to body at the base of the neck, then place a few stitches a little higher on the neck, sewing the neck to the shell so he can hold his 'lil head up. Weave in ends. Pick up a stitch where the tail should be. Join Color 2 to picked up stitch and Ch 2. YO and pick up a second stitch right next to the first. HDC. YO and pick up a third stitch at a triangular angle to the first two. HDC. Ch 2. Tie off. Weave in ends. Give 'em some eyes! Stitch on a droll little mouth! Happy Turtle! Thank you for this cute pattern! But I have to confess, that I have some difficulties with the belly. What I don't understand is: you start with a hdc in first backloop and than work over all stiches with ivisible decrease. So I end up with 29 stiches I worked over. What is with the 30th stitch? Do I have to skip it? Next thing is, that the hole in the middle is so small after the second row, that a 3rd row doesn't fit in... what am I doing wrong? Would be nice if you could help me! As for row three of the belly: did you switch to Single Crochet in row two? That's the only thing I can think of. If it's still not working out (your HDC's may be taller than mine? Possibly...and these decreases can be tricky business!) -- You could 1.) try to do the first row also as a single crochet OR, 2.) you might just leave off with row two (8 stitches) and pull the tail end through all loops to close. I've closed off 8 loops before like that with no problems. Also, I'm probably not much of a pattern designer. 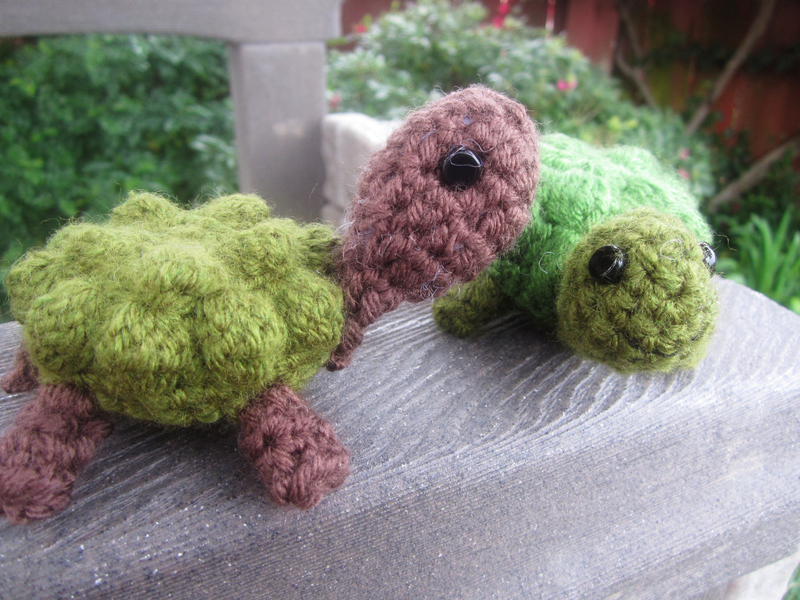 I just make stuff and frog it and redo until it looks right. :D.
Cheers and good luck! Let me know if you run into any other problems!